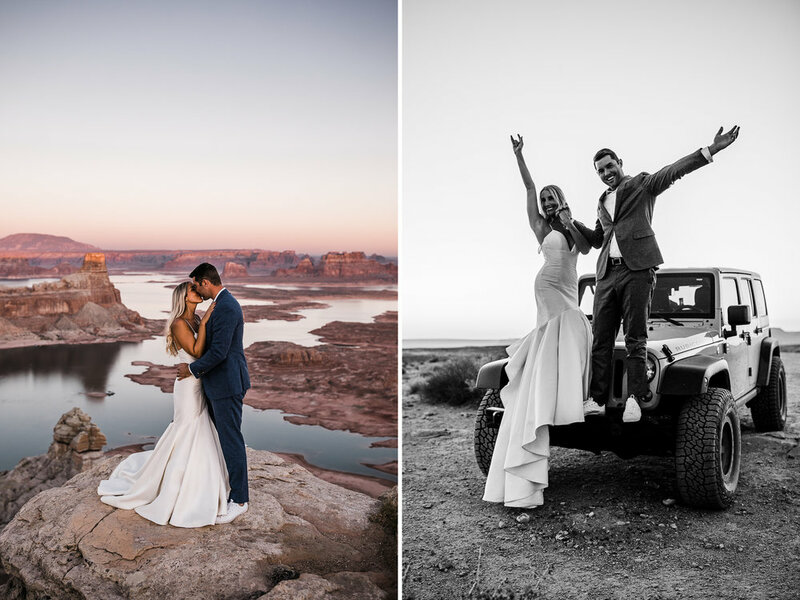 When Krista and Justin reached out to us about their adventure wedding, their plans were simple - they wanted to start at Horseshoe Bend and were open to adventure from there. We've been loving traveling to areas only accessed by 4x4, so we recommended renting Jeeps and exploring some less trekked out places in the area. They were stoked on this idea as they had a Jeep back home and loved the prospect of exploring unknown beauty on their wedding day!! I found a spot while canvasing Google Maps and looking for some epic offroad adventures on the Utah/Arizona border. Once I dialed it in, I sent a few pictures to Krista and asked what they thought about doing their ceremony out there. She checked with Justin, and they loved the idea! Planning these days is one of my favorite things about my job - how much brides and grooms trust me to find the perfect little location for their ceremony. There's more to it than just finding an epic, like taking into account how much adventuring, how much relaxing, and how to balance a couples comforts and aspirations to make a perfect day for them. I knew this spot was perfect for them, but what I didn't know is how this spot would end up being one of my favorite places we've ever gotten to go!! We met up at Horseshoe Bend for a first look which was beautiful! The Bend is definitely one of the busier places we shoot, but there is something a little special about it - the cheers of the hikers, the love people give on a whim when seeing a couple in love dressed up for one of the biggest days of their life, all of it makes for a beautiful impromptu celebration among strangers. We spent a little time there shooting and enjoying the view. Places like this are hard to leave, but we were excited to do some exploring and knew there was plenty more out there to see. My brother Conner met up with us to officiate, and we all piled into a Jeep to drive out to the ceremony spot. The road was definitely an adventure, and the vast Mars-like terrain made us stop quite a few times along the way. A couple of hours had passed by the time we reached the ceremony spot, and we all jumped out of the Jeep, stunned by the location. I smiled as I watched Krista and Justin share in an exciting moment, looking at each other, smiling, laughing, and cherishing the experience. Our couples are always beyond stoked with what we choose, but seeing it fresh in the moment is so special to me. Justin made cocktails with sparkling waters for everyone, and we all walked around to pick out a spot for their ceremony. 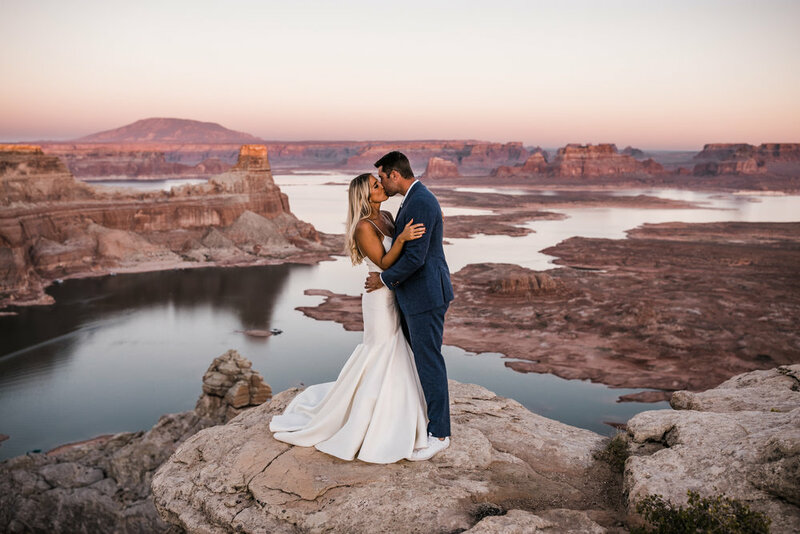 Krista and Justin fell in love with a natural stage of sandstone overlooking Lake Powell below, the moon above the horizon in the distance, the sun lighting the foreground with a shadow stretching out far below. They walked down the stone slab "aisle" with their guests - sandstone mesas, a blue lake, distant mountains, greeting them in the distance. Conner was waiting for them near the edge. Let me just say how much I appreciate my brother not only for taking the time to travel from Texas to officiate adventure weddings at these amazing locations but for how much he does to make sure he's more than a guy to "sign the papers" at the end of the day. He's the kindest, most caring person I know, and it shows when he talks about our couples. It's always personal and beautiful and fits in perfectly with the couples exchanging of vows and promises to each other. Today was no different as Justin and Krista exchanged the sweetest vows while wiping tears away, giggling and smiling while looking deeply into the other. We celebrated with a champagne toast before letting Krista and Justin explore ahead of us for some amazing pulled back shots of the couple among the landscape that will forever be their spot. Just minutes after their ceremony they were walking hand in hand, a tiny bride and groom among a massive landscape. To be here felt so and so small at the same time. There's a beauty in belonging in your own little way, in your smallness among the mass of nature, claiming a tiny slice of time in history to belong so intimately to something this grand. I think this is what our couples are drawn to and what will keep them coming back to celebrate, to claim more special moments and put themselves as little dots on the timeline of here. Justin led everyone to a stunning overlook where we watched the pinks, blues, and faint oranges rise from the earth as the sun faded away. This part of the country is beautiful in what the light does to the landscape. Shadows creep into each nook of the desert, each rock, cliff, and canyon claiming their own beautiful shade of a red or orange, the water contrasting with blues and purples, the light dancing over the edges of cliffs, and moving like a rush of water over the distant landscape. The air chills and both the moon and Krista's dress glowed brighter the more blue hour set in. Sunsets out here feel more like a dance - the light moving with our couples, no motion or change in posture or shade is distracting, but rather both actively complementing the beauty of the other. We returned to get some shots with Krista and Justin on the hood of the Jeep. I hopped on Callen's shoulders which is a signature move for us to get a slightly different view. The desert colored Jeep looked so good among the matching sandstone! We decided the light was too good and went back out to get some pictures with the moon shining brightly above the lake and sandstone below. Krista threw a jacket on over her dress and we shot for a whole half hour after the sun went down. As we made our way back to the Jeep, Krista remembered they bought a cupcake to split, and they fed it to each other behind the Jeep. 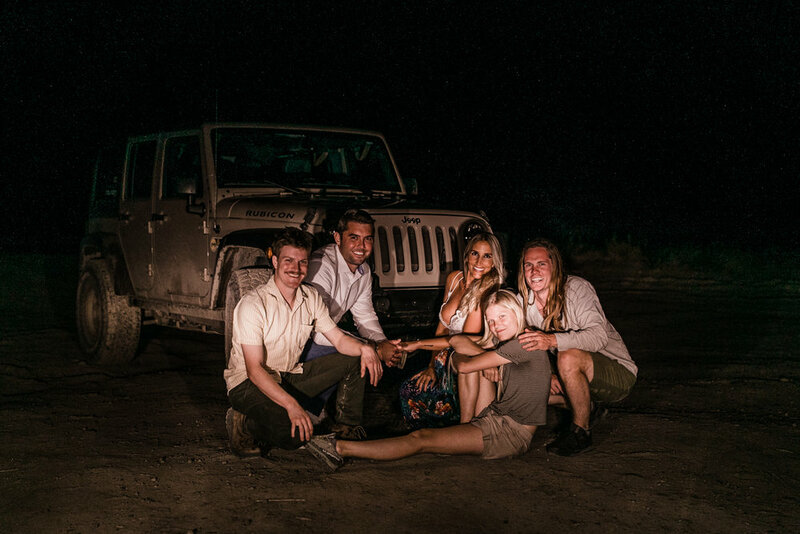 As it got darker, we all piled into the Jeep to head back to town and as we pulled up to Conner’s car (the Adventure Prius wasn’t quite equipped for the 4x4 road…) we put on our headlamps and signed the wedding certificate on the hood of the Jeep. We snagged a group shot before saying our goodbyes and promising to see each other again soon. I was grateful for getting to spend the day with a beautiful couple in a place that fit them so well. I can't wait to keep up with them as they head off into their life as newlyweds. I'm also stoked to head back to Page for a workshop we've got in February to show other photographers around this beautiful area. I'll be remembering Krista and Justin then for sure as it's impossible for me not to remember the people along with the landscapes that make a place so special.